When Hurricane Katrina hit the Louisiana coast twice on August 29, 2005, I, like many worldwide, was glued to news of the horrific devastation. As I watched, my heart went out to ordinary people losing *everything* in the storm. Where would they go? What would they do? How could they rebuild their lives? I wondered, what if it had been me instead? What if disaster had struck my area? How would I, my friends and family cope? As I saw families separated by rescue efforts, my heart went out to them. Could I help? 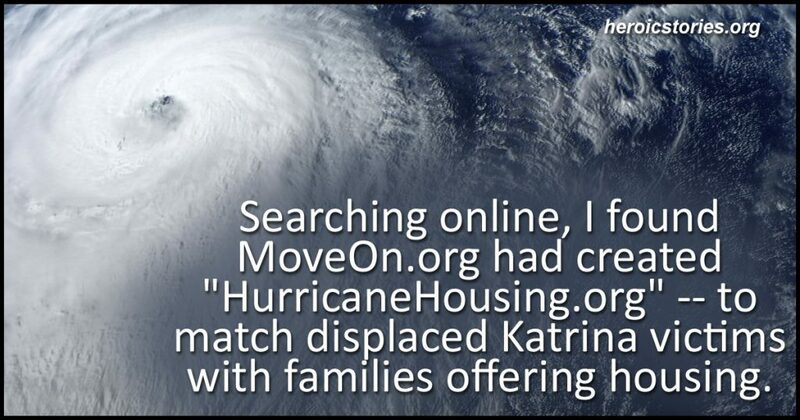 Searching online, I found MoveOn.org had created “HurricaneHousing.org” — to match displaced Katrina victims with families offering housing. Thousands upon thousands of people from around the USA were offering to take in Katrina survivors! This is who we humans truly are. People who make offers like: “Air fare for *four*.” “Grandson will help children adjust.” “Furniture for family of six.” We should be proud, that we’re compassionate enough to create a web site like HurricaneHousing.org. And I’m relieved. For I know if disaster strikes my area, similar web sites will arise, and our fellow humans will reach out to offer us everything we need to begin anew. THESE are examples of the America we all WANT to live in, not the one where we try to make selfishness a new American value.